A sequel is like a cinematic appendix. Essentially useless in the grand scheme of things, it’s there regardless, leaving us to either peacefully coincide with it or dread the moment it explodes in our bellies with a big burst of mediocrity. Of course, this doesn’t apply to all sequels, for there are several that actually justify themselves by advancing the story or taking their characters in new, intriguing directions. Shinobi No Mono 2 was one of these films, one that amped up the drama and took its themes one step beyond that of its predecessor. 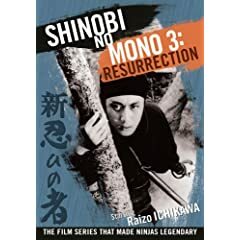 On the other hand, Shinobi No Mono 3: Resurrection is less fortunate, valiantly attempting to score a franchise hat trick but ultimately, as is with most follow-ups, existing merely for its own sake. When we last left the lad, pissed-off ninja extraordinaire Goemon (Raizo Ichikawa) was in a bit of a jam. While he succeeded in offing warlord Oda Nobunaga, his celebration proved to be short-lived, as his botched attempt to assassinate sneering successor Hideyoshi (Eijiro Tono) led to his capture. Thankfully, Goemon was spared being boiled alive, spirited to safety by shady fellow ninja Hattori Hanzo (Saburo Date). But this new beginning hasn’t cooled Goemon’s jets in the slightest. In fact, he’s even more determined than ever to kill Hideyoshi and prevent him from picking up where Nobunaga left off. But as he embarks on his final quest for vengeance, little does Goemon realize that he’s being used as a pawn in another clan’s power play, an endeavor that may lead our hero right back to where he started. Those who’ve seen it will know what I mean when I say that Shinobi No Mono 2 is a tough act to follow. Not only did it increase the dramatic tension, it ended on what seemed to be a pretty final note, what with the main villain pushing daisies and the hero himself facing certain death. The filmmakers had a hot series on their hands, so they couldn’t leave things be after just a pair of pictures. Thus, for Resurrection, a bit more fudging has been done with the story’s history, which is fine by me. It’s a franchise that made a habit of blending fiction with real-life figures, so as long as not too many liberties are taken in the name of entertainment, I’m cool with it. But my gripes with Resurrection aren’t so much with its content as they are with how it’s covered. Without spoiling anything, I will say that this is the last we’ll see of Goemon; Raizo Ichikawa would go on to make a few more Shinobi No Mono movies, but as different characters. The film takes on the task of closing out Goemon’s story, which would’ve been great — had it not focused on everyone but Goemon. The Shinobi No Monos have come filled with their fair share of extraneous story threads, most of which involved Nobunaga’s efforts to rule all of Japan under his boorish but brutal fist. But now that the fellow has met a grim fate, it’s fallen upon Hideyoshi to take up duties as the primary baddie, a transition that meets with mixed results. I understand why director Kazuo Mori chose to focus more on the villain’s goings-on than the good guy’s; seeing Goemon brood while unaware of the infighting tearing apart Hideyoshi’s clan makes for an ironic twist. But too far does Goemon fall by the wayside and get shortchanged of the completed character arc he deserves. Consumed with vengeance for two movies straight, it’s disappointing to see the guy’s quest end on so anticlimactic a note; we know what’s coming, but the film doesn’t quite earn the point it arrives at. The added subplot of Goemon unwittingly working for a rival clan only serves to confuse more than intrigue, especially when it drops out of the picture for so long, only to be dragged kicking and screaming back into focus. However, by no means is Shinobi No Mono 3: Resurrection a lost cause. Its depiction of ninja culture continues to remain grounded but effective, the action sequences scarce but all the more compelling for it. Five films in the series remain after this one, and although Goemon’s tale has come to a close, the next movie at bat may just be the sort of new beginning Shinobi No Mono is looking for. This entry was posted on Saturday, May 16th, 2009 at 9:33 pm	and is filed under Reviews. You can follow any responses to this entry through the RSS 2.0 feed. You can leave a response, or trackback from your own site.